Yesterday we traveled on Highway 89A 2.9 miles past the Mingus Mountain summit for our hike. We followed the route of the original wagon road from Jerome through Mescal Gulch on Trail #547. We climbed a gentle grade that zigzagged through a shady forested area that experienced extensive mining activity throughout the late 1800s ans early 1900s. We looped back on the Bug Hollow Trail #548 trail. This followed an old road across the forested terrain of Mingus Mountain with views of the Woodchute Wilderness. About halfway down this trail there is a wide meadow where one needs to look for the rock cairns marking the trail. Later the trail traverses loose limestone cobble where one must watch each step. 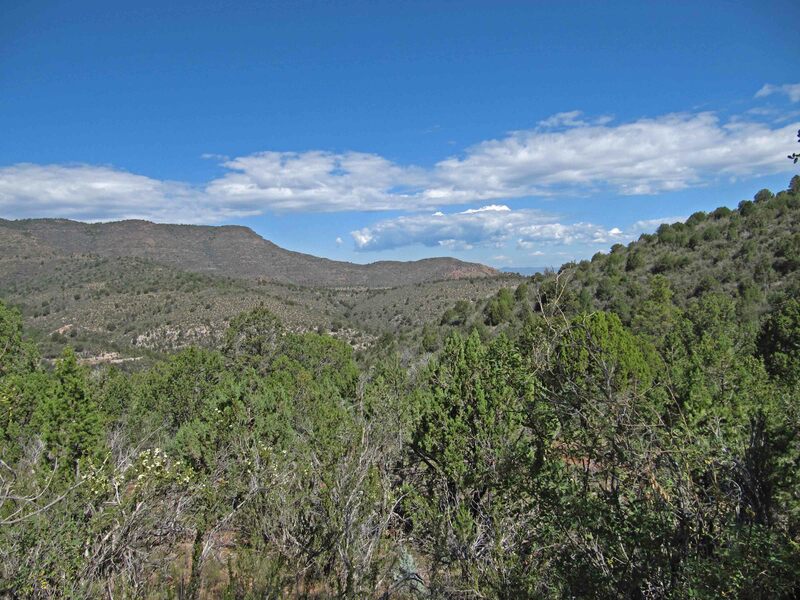 You are rewarded, however, with views of the Verde Valley. The trail started at an elevation of 6,250 feet and climbed to a high point of 6,700 feet. This 3.4 mile loop is considered a moderate hike. We stopped at the Jerome Palace’s Haunted Hamburger for lunch with a view. We then walked up to the Jerome Grand Hotel, a National Historic Landmark, which featured several Halloween displays. The end of September is a great time to explore this part of Arizona. 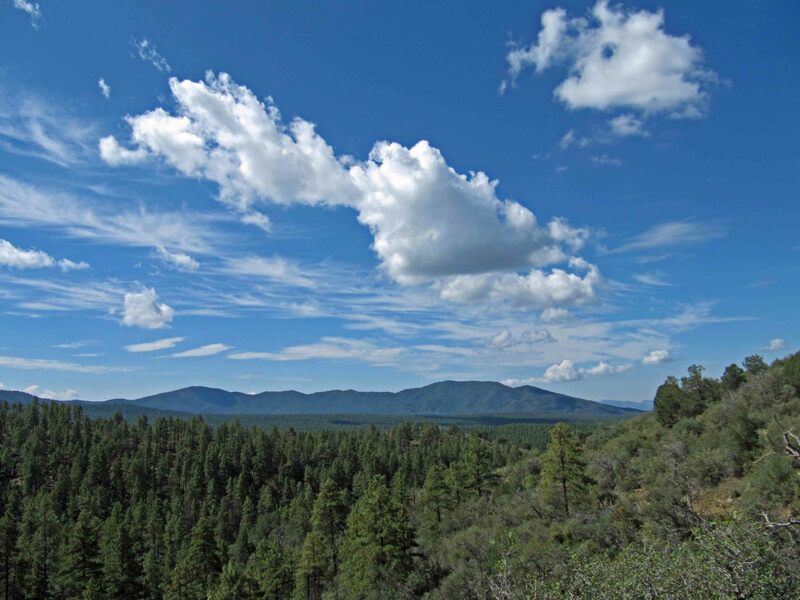 The parking lot for Thumb Butte is only 2.1 miles from our Prescott mountain home. This morning we decided to hike the popular Trail #33 to a ridge just below iconic Thumb Butte. For the first time I ascended via the east side of this loop trail which is paved but steep with switchbacks and a 12-18% grade. The elevation starts at about 5,600 feet and climbs about 600 feet. The panoramic views and the profuse wildflowers made for a great hike. The picture displays curlycup gumweed in the foreground from the ridge near the top of Thumb Butte. On our descent on the west side we encountered an Arizona black rattlesnake. He slithered from the trail to the shade of a small shrub. Be careful out there! “Annie,” a Prescott Center for the Arts production, opened this past weekend at the Yavapai College Performing Arts Center. This venue offers a flexible stage with no obstructed views and more seating than their usual theatre. We attended the Saturday evening performance of this play set during the Depression. During this election period, elements of the story seem timely as it portrays a super wealthy businessman interacting with a Democratic President. Eleven-year-old Carly Fonda did a great job in the lead role as Annie. Versatile Dina Mountcastle played the mean orphanage matron Miss Hannigan. Christopher Eubank’s commanding presence and bald head fit the bill for Oliver “Daddy” Warbucks. I especially enjoyed Timothy Keena as sleazy Rooster. The orphans, who include Sage Taylor, portray waifs while belting out their assigned songs with aplomb. One of the most remarkable performances was by Sandy, Annie’s dog. Too bad he didn’t get to take a final bow wow. If you haven’t seen this production, don’t miss one of the performances next weekend. The Prescott Rodeo Grounds are about a mile from our mountain home. Yesterday we walked to the trailhead for the Rodeo Trail and then explored this network of trails that circle through the massive rock formations behind the Doc Pardo and Danny Freeman buildings on the grounds now devoted to the July 4th rodeo. The trails were originally built by participants in Civilian Works Administration 1930s projects and only recently rediscovered. The half mile of trails have a low point at 5,417 feet and rise to a 5,477 foot summit with vistas including views of Thumb Butte, Granite Mountain, and the “P” in the Bradshaws. This is an interesting hike near our home. For the first time we used two vehicles for a hike. We parked one vehicle at the trailhead for #62 on Walker Road. Then, we traveled to the trailhead for #299 on the Senator Highway near Goldwater Lake. We climbed about 1.3 miles on Trail #299 which is known as the Watershed Trail because at its peak, about 6,900 feet, it separates the Bannon Creek watershed from the Lynx Creek watershed. The picture for this entry was taken of the vista near Deer Lick Spring where we spotted a cement water tank. At the junction with Trail #9854, Seven-Mile Gulch, we followed it for almost a mile. We then descended almost 1,200 feet on Trail #62, Ranch Trail. When we planned this hike our map showed the distance to be about 4.7 miles, but we figure it closer to six miles. Many patches of loose rock over steep terrain required careful navigation to avoid falling or twisting an ankle. 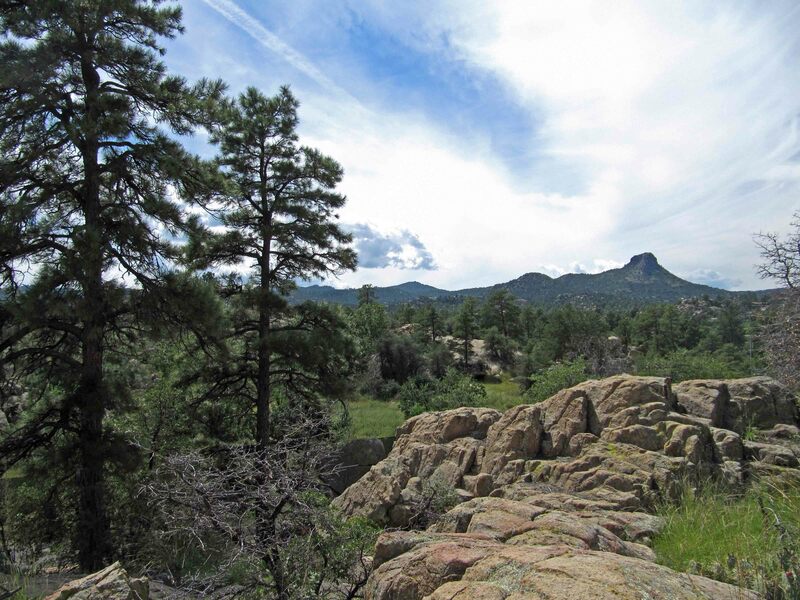 In addition to enjoying the vistas in different directions, this hike took us through most of the vegetation types represented in the Prescott area. Arizona has some 4,000 wildflowers. This year’s monsoon rains resulted in a flourish of wildflowers surrounding our Prescott home. 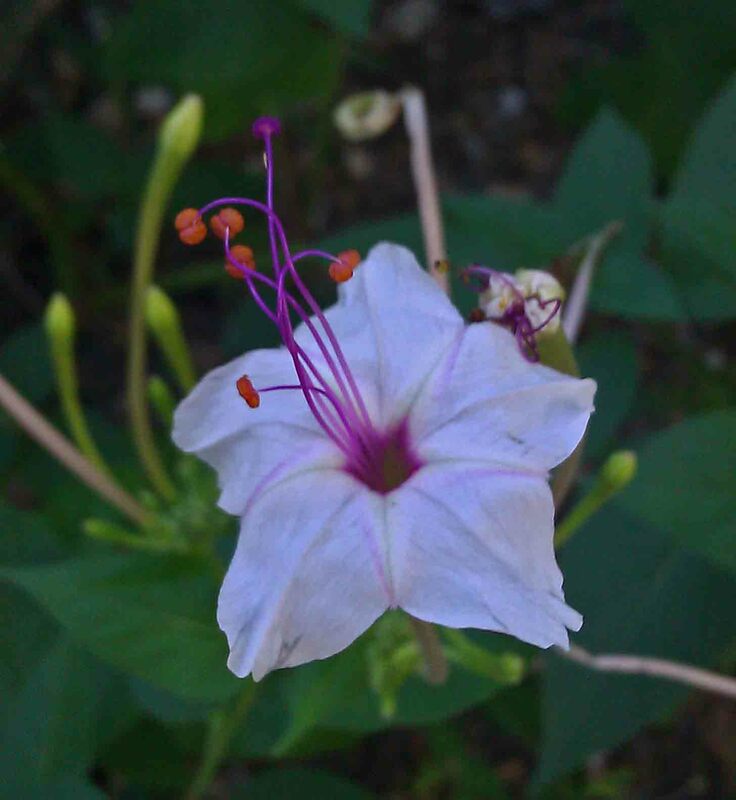 One of the prettiest wildflowers is the sweet four o’clock which stands at just over three feet high with blooms that stand straight up until late afternoon when a white blossom opens to reveal six long stamens and red anthers. Another of my favorites is the sky blue birdbill dayflower whose three petals and six yellow stamens sits just over a foot off the ground. Earlier, Colorado four o’clocks graced our front yard. Now displaying themselves are the smaller narrowleaf four’o’clocks with a trumpet shape and five reddish purple lobes. Small matweed has formed dense, spreading mats of tiny white flowers close to the ground. Shorthair goldenrod stands three to four feet tall in the side yard. The deep purple flowers of ivyleaf morning-glory are in a bed near the road. The white flowers of spreading fleabane and the yellow flowers of curlycap gumweed have joined the long flowering bright yellow butter and eggs and red beardlip penstemon, favored by our hummingbirds, to create a colorful ground cover in our woodland setting. In addition to the shade from distinctive tall ponderosa pines we have a few pinyon pines and alligator junipers surrounding the house. Prickly pear cacti bloomed earlier and now show red fruit. Claret cup cacti are present but haven’t been seen in bloom. Next assignment: identify the various grasses around the house. 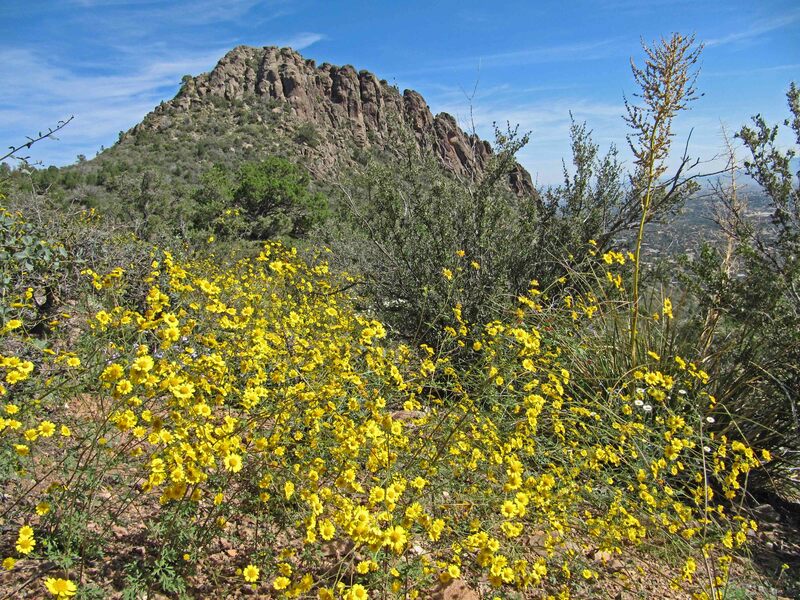 Arizona wildflowers provide a distinctive natural landscape.